Artificial intelligence (AI) is deemed to become one of the century's main drivers of economic competitiveness. In this field, startups – not multinational corporations – have become the most powerful drivers of innovation, developing technologies such as image recognition, natural language processing and automated driving. In the global AI race, creating a thriving ecosystem for these new players is key. The United States has established leadership with nearly 40% of all AI startups located in the country. Far from being out of the game, Europe ranks second, with 22% of startups, ahead of China and Israel. These are the findings of the latest study, "Artificial Intelligence – A strategy for European startups", for which Roland Berger and Asgard partnered up to analyze approximately 3,500 AI startups from among the first comprehensive global dataset, and to put forward recommendations to be implemented at the European level. "Coming in second reveals real dynamism, but cannot obscure the fact that European assets remain fragmented, without a clear EU-powered strategy to coordinate and structure the AI ecosystem. Europe has no other choice but to speak with one voice on AI," says Charles-Edouard Bouée, CEO of Roland Berger. As Fabian Westerheide, founder and CEO of Asgard remarks, "The economic challenge for Europe is twofold: allow for the emergence of AI champions, and rapidly adopt AI technologies to benefit from competitive gains, without being left behind by early adopters in more mature American and Asian markets." None of the European countries reaches critical mass on its own, with the UK ranking 4th (245 startups), France 7th (109 startups) and Germany 8th (106 startups). "This finding makes a case for initiatives taken at the European level – rather than at national levels only – favoring the creation of an attractive ecosystem in the face of American and Chinese competition," says Axelle Lemaire, Global Head of Terra Numerata™, Roland Berger's digital business network that brings together incubators, investors, technology providers, and digital players of different sizes and sectors. Furthermore, some of the most economically important sectors in Europe are barely represented in the overall distribution of startups, for example energy (2%), automotive (1%), real estate (1%), agriculture (1%) and public administration (less than 1%). "We would have expected leading European technologies such as robotics, the Internet of Things (IoT) and self-driving cars to be overrepresented in the global context. Our results diverge from this assumption, raising the issue of mature European industries' ability to adapt to the next key technology trends and maintain their leadership position," adds Westerheide. 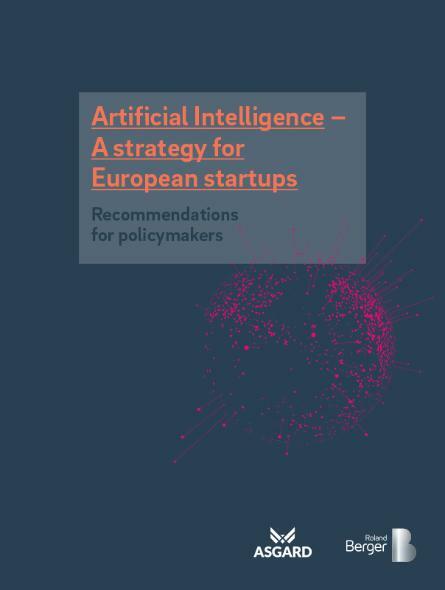 Roland Berger advocates for ambitious measures on a European level to allow startups to drive the evolution of AI across the continent. A so-called YES! status ("Young European Startup") would allow startups to benefit from new fiscal and social programs and would grant them access to the entire European market. Such a status would facilitate cross-border activities, recruitment of highly skilled staff within Europe and international investments. The broad outlines of this status and its specific content should be defined directly at the European level and must go beyond simply aligning pre-existing national measures. 2. Boost investment in YES! Access to funding for European AI startups remains limited, with the average fundraising deal for an AI startup in France amounting to USD 3 m in 2017 or USD 2 m in Germany, as against USD 10 m in the US and USD 36 m in China. To improve this situation, Europe should focus on encouraging investments by large corporations, while generally diversifying the sources of innovation funding. Public funding also has a role to play in the form of public-private investment vehicles through the European Investment Fund, and increased commitment in the EU budget. The implementation of a powerful European Innovation Agency could support the European AI ecosystem's development. Europe must position itself as an attractive destination for foreign entrepreneurs and researchers. In this context, the creation of a European Startup Visa could raise the EU's ability to attract talent. Moreover, the capacity of startups to develop products and services together with research laboratories by promoting entrepreneurial initiatives, mixing teams and speeding up technology transfer processes is essential for startups' success and must be encouraged in European programs. "Beyond the so-called arms race between the United States and China, there is room for a third path that would be European. For that to succeed, the continent does need a unified plan, which would bring together all available resources and energies to amplify their impact," summarizes Lemaire.